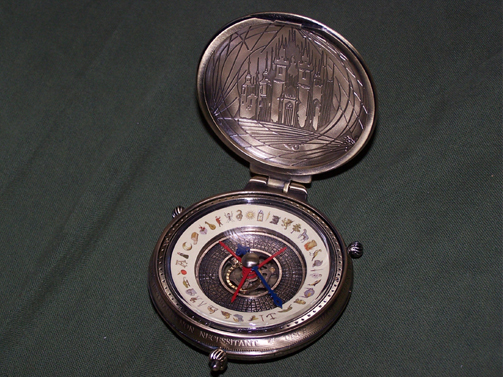 As a huge fan of Philip Pullman's His Dark Materials series and the film adaptation of The Golden Compass, I was virtually drooling from the moment I saw the alethiometer replica produced by The Noble Collection as a merchandising tie-in for the movie. 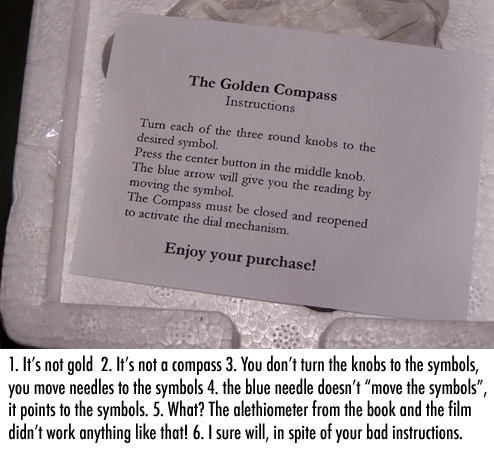 I don't think there was a commercially available alethiometer replica of any kind available until the Golden Compass film came out in 2007, though many fans have made their own versions, some papercraft, and others that could pass for the real thing. At $200.00 US, Noble's high end replica was quite out of my range (the other option was a 20 dollar plastic toy), but thanks to a 50 dollar off cupon found in the DVD case of The Golden Compass, I was able to literally scrape the bottom of my barrel to shell for one as a self-brought Christmas gift. Always a borderline-Engrish instruction sheet with things like this. Oh yeah, this thing is so awesome. 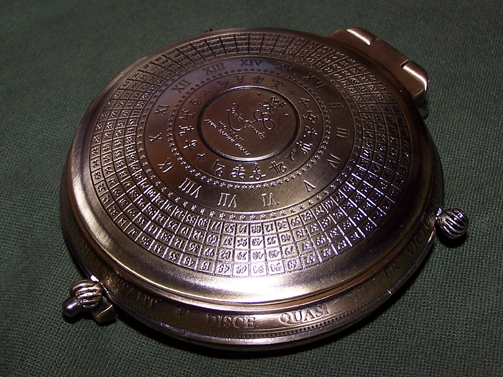 A close up of the dial. The question I attempted set is "Will my work in writing bring profit?" 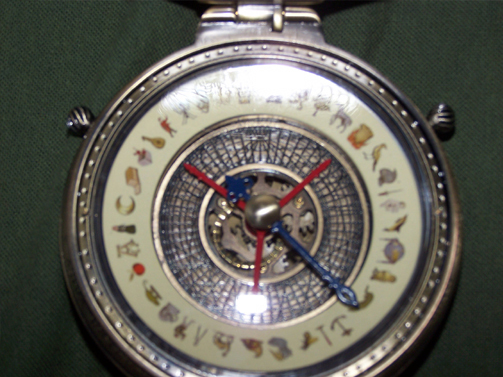 As you can see from these pictures, the alethiometer replica from The Noble Collection may be the closest you'll ever get to owning a real alethiometer unless you're Philip Pullman and can hire a jeweler and watch maker to have one custom made for you. 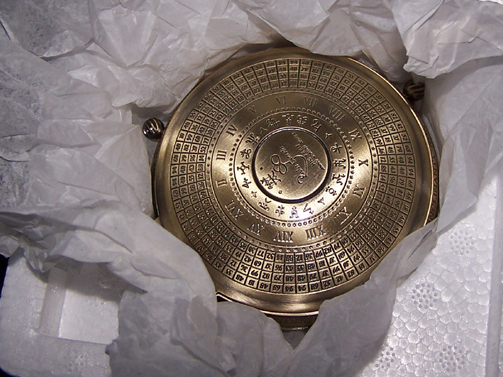 This is a heavy, great looking, and great feeling copy of the prop used in New Line's ill fated The Golden Compass film. The blue needle mechanism works just like the one seen in the 20 dollar toy alethiometer and spins around like a board game spinner when a button is pressed. For the 200 bucks Noble is asking for, I would have liked a motorised mechanism like the actual film prop that deliberately pointed to a few symbols at random, but perhaps this may have been a bit much to ask considering the level of quality already present in this item, plus the fact that such an assembly would have required batteries of some kind, and a battery latch of any sort would have ruined this peice, which is pretty much as perfect and as real as an alethiometer can get short of actually being able to communicate with the divine. 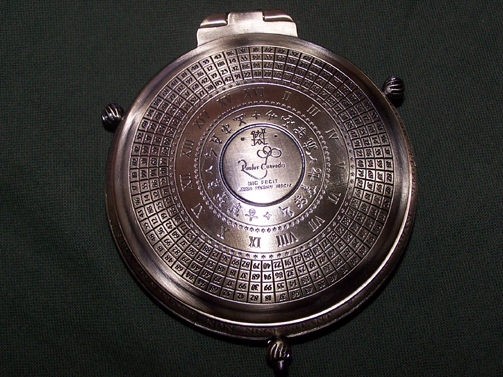 It was a huge relief that there was no visible indication on the alethiometer that it was a commercial product. I was worried that I'd look on the bottom and see "COPYRIGHT NEW LINE 2007 ALL RIGHTS DESERVED MADE IN PRAGUE" or something like that, but everything about this item is just what you'd expect from an actual artifact. 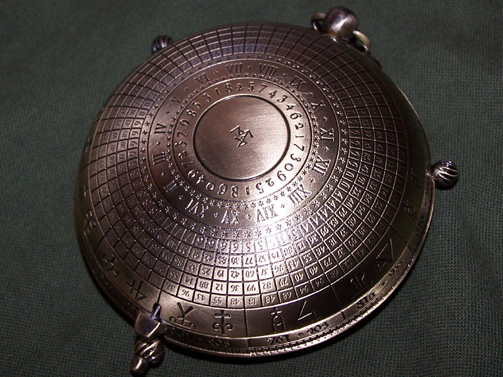 The Noble Collection alethiometer replica is a solid, satisfying object to own. 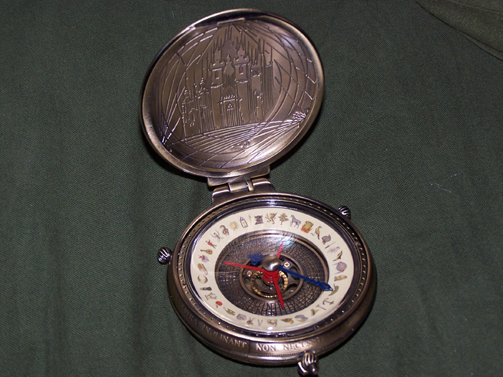 For a serious, heirloom quality souvenir of your nerdy, fanboyish/girlish affection for His Dark Materials, you can't go wrong with this product, though I still say its probably the single most expensive and pointless thing I'll ever purchase. For more hot alethiometer action, check out my video review on You Tube. If you want to be a huge nerd like me and have your own overpriced solid bronze board game spinner, head on over to The Noble Collection's Website and get yours while you still can. Seriously, they already discontinued the Spy Flies, so I can only guess how many more alethiometers they plan on making.